Here are some possible answers to the second set of questions. 1. How many more years until we have to pack up and move to another planet, because the sun died? Firstly, let's look at how our Earth is thought to have come to be. Heather and Keira from California had challenged me to explain how the Earth had begun. Here is a link to the post I wrote for them if you are interested. ... and here is a link to a Wikipedia post looking at history of the Earth. It is about Earth from its formation to now. Okay, we have an idea how our Earth began but how might it end? As our planet's birth was linked to the formation of our sun, the sun is also involved in its suspected end. Back in 1987, I was able to look into the night sky and see a "new" star. A star astronomers named SN 1987A had gone supernova. It is about 168,000 light years* from Earth and could not normally be seen without a powerful telescope. It is again too dim to be seen without a telescope. Had it been our star, our planet would have been destroyed. Then what about our Sun? How old is it? What might happen to it? When might it happen? This is a NASA photo released into the public domain. It was sourced through Wikimedia Commons. Our Sun is thought to be about 4.6 billion (4,600,000,000) years old. I had to do a little research about the Sun to find out what might happen. 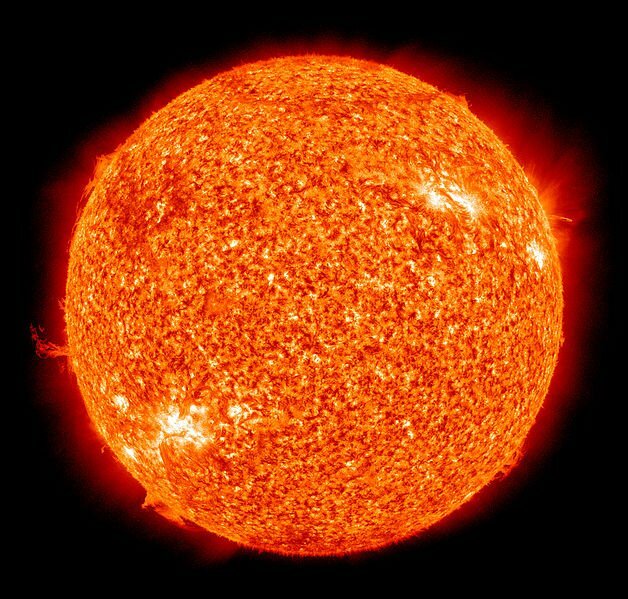 I found interesting information suggesting our Sun is becoming brighter by about 10% every billion years and it's surface is slowly becoming hotter. As it gets older and burns more of its hydrogen fuel it will grow in size to eventually become a red giant. By this time Earth, if it still exists, will not be able to support life. The video clip below shows what might well happen when our to end of world. Duration: 3:04 minutes. It replaces the original linked video clip now blocked from viewing in Australia due to copyright issues. It is thought it could take about 5 billion (5,000,000,000) years before our Sun is a red giant and perhaps 1 billion (1,000,000,000) years before the Sun's rising temperature means all water will evaporate away from Earth. A billion years is a very long time. However humans develop in that time, we can only hope they have solved the problems. 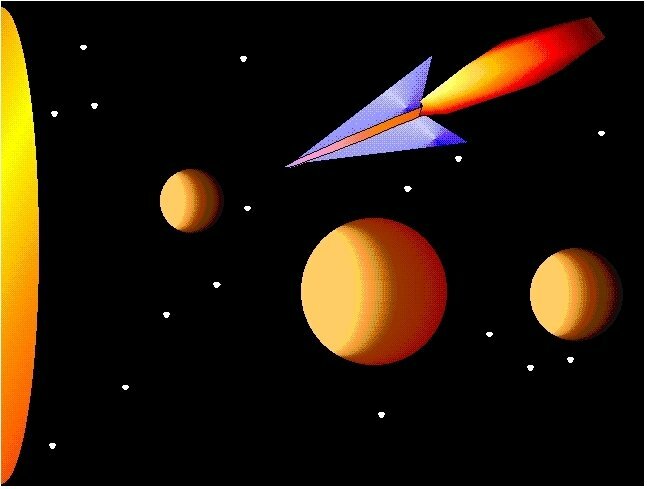 For a time until the sun gets too big or hot this might mean people moving to Mars but to go to other stars people might have to spend a very long time in space. By the time people reach other stars, they could be the great, great, great, great,... great, great, great, grandchildren of those who left Earth. 168,000 light years* - as explained in Part 1, a light year is the distance light travels in a vacuum in one Earth year. While I saw the supernova as a bright star in 1987, the light had started on its way 168,000 years ago. When we look at stars, we are looking back in history. Even light from our own sun started its journey about 8.3 minutes before we see it. 2. Did you know that there are many different galaxies in space? Yes. Too quick an answer? 🙂 I'll share some NASA galaxy photos using links. The two galaxies shown here are in the early stage of an interaction that will eventually lead to them merging in millions of years. The two galaxies are about 450 million (450,000,000) light years from us. If you look carefully you can see other galaxies in the distant background. This second photo shows galaxy M33. It is about 3 million (3,000,000) light years from Earth. The really bright stars are young, very large stars. Yes, stars are still being made in our universe from the remains of other stars. The third photo shows galaxy Centaurus A. If you can see what looks like a line of white light coming from its centre, that's the result of Centaurus A having a supermassive black hole at its centre. Galaxies are not all one size. Dwarf galaxies might only have as few as 10 million (10,000,000) stars whereas giant galaxies might have up to 100 trillion (100,000,000,000,000) stars. There are estimates the might be up to 170 billion (170,000,000,000) galaxies in the observable universe . There may be very many more but they are so distant their light still hasn't reached us, they're not yet observable. That's a lot of galaxies. I like looking at big numbers so let's look at big numbers. I have said their might be 170 billion (170,000,000,000) galaxies in the observable universe. I also said galaxies could have from 10 million to 100 trillion stars. Let's say the average galaxy has 1 billion (1,000,000,000) stars. How many stars might their be in the observable universe? 3. Did you know that Pluto has 2 more moons? Yes, but I found there seems to be more discoveries when I was researching. In order of distance from Pluto they are Charon, Styx, Nix, Kerberos, and Hydra. It is possible more small "moons" might be found. Click to read Moons of Pluto on Wikipedia. When Pluto was discovered in 1930, its brightness suggested it was much larger than it was found to be but that was because it is icy. Charon was discovered in 1978. I always found its name was a great choice. In ancient Greek mythology, Pluto was the god of the underworld where people went when they died. To reach there, you had to cross the River Styx. This could only happen if you had a coin to pay the boatman, Charon. It was common for ancient Greeks to bury their dead with a coin so they could pay Charon. This is why I thought the name is a good choice. Pluto and Charon are together in ancient Greek mythology. One unusual piece of information I read was about Pluto and Charon. Moons orbit around their planet as does our moon but Pluto doesn't seem to be the centre of Charon's orbit. The centre of orbit is somewhere in between but closer to Pluto. What a strange place Pluto would be. While searching online, I found an animated file showing a computer generated rotating image of Pluto you might like to see. It's based on NASA images of the surface of Pluto. This an embedded NASA file in the public domain. 4. Did you know that Neptune's ring is made out of ice particles? Below is my favourite image of Neptune. NASA released this image into the public domain. Neptune's atmosphere seems to be mostly hydrogen and helium. "The interior of Neptune, like that of Uranus, is primarily composed of ices and rock." (Wikipedia). Remember, ices aren't necessarily only water. Have you heard of dry ice we can buy here on Earth? It isn't water. It's icy carbon dioxide. For Neptune, the ices are thought to be mostly water, ammonia and methane. The core of the planet is said to be rocky. The next NASA image was taken by the Voyager 2 and shows the rings on Neptune. The rings are thought to probably contain large amounts of micro-dust as well as ice. 5. Did you know that it takes 1 month for the moon to orbit around the earth? This embedded graphic shows the phases of the Moon seen as it orbits the Earth. Do you notice we only see one side? The other side is often called the dark side. It also comes into sunlight but, since it faces away from Earth, we don't see it. This work has been released into the public domain by its author, Tomruen. This applies worldwide. This is an interesting question even if it sounds simple. Rather than say "yes" or "no", I might ask what type of month? I know the months we talk about run from January to December. February has 28 days or 29 in a leap year. The others have either 30 or 31 days. The average number of days in a month is about 30.4 days. If you mean one of our Gregorian Calendar months we use, the answer is not quite a month. When compared to the position of stars, the Moon takes about 27.3 days to orbit the Earth but Earth is also moving through space so the time between two full moon is about 29.5 days. Did you know there was something known as a lunar calendar? The calendar we use is a solar calendar. It's based on the time it takes for the Earth to complete one orbit around the Sun. Lunar calendars are different because they are based on cycles of the Moon. Many cultures have had lunar calendars. One of the important examples is the Islamic Calendar. A year has either 354 or 355 days where as the Gregorian Calendar has 365 or 366 days based on a solar year. If you have Muslim friends, you might know the first day of their new year is a different day on our calendar each year. This happens because their lunar year is 11 days shorter. The Gregorian solar year has an average of about 30.4 days per month giving us about 365 days a solar year. The Islamic lunar year has an average of about 29.5 days per month giving us about 354 days a lunar year. Can you see the solar calendar gives us about the time it takes for the Earth to complete an orbit of the Sun while the approximate number of days in a lunar month is how long it takes the Moon to go from one full moon to the next? The embedded diagram below shows how the phases of the Moon come about while the Moon orbits Earth. 6. Did you know that (it takes) a year for the earth to orbit around the sun? Our Gregorian solar calendar is based on how long it takes the Earth to complete one orbit of the Sun, that is it takes about 365.25 days for Earth to orbit the Sun. We call that a year of 365 days with a leap year helping us catch up on the extra bits by having an extra day. What would a year be on other planets and dwarf planets? Here are the other planets and known dwarf planets in our Solar System with how long their years would be in our Earth years (Ey). Posted in Environment & Weather, One World, One People, Science in the Classroom, Space, Technology and tagged Centaurus A, Charon, Earth history, galaxies, galaxy, Hydra, hyperspace, Kerberos, light year, lunar month, lunar year, M33, month, Moon, Nix, observable universe, Pluto, red giant, solar year, stars, Styx, Sun, supernova, supernova SN 1987A on July 9, 2013 by rossmannell. It is me, Liv from grade 4KJ. I must say your post about space was really interesting. I must say I would like to read it all over and over again. I must say space is so interesting and cool to learn about and I love how it is so far away from us in earth. Well to be exact it is not really that far away from where we are because it is everywhere around the world. The videos you put in there were so cool and interesting to watch but I could not look at the first one. It was nice that you said these are not my videos. I hope you can get a little bit of time to check out my blog post because it would be so special to me if you could be the one to see my first video. It was so nice of you to send us the DVD you were making during the month of August because it looks so interesting. We got it yesterday and looked at it today but not to mention we are so excited to watch it and can’t wait. We may be doing it today because it has been raining here just a little bit. I hope to see more great posts like this from you and my friend Jess would like it if you could visit her blog if you have time. Thanks again for writing this information on your blog and I hope to see more great blogging things from you very very soon. It took about two days to put the post together. Much of the time was spent finding suitable links. As far as the first video clip is concerned, I checked it and found I also can’t view it. It seems the person who posted it to You Tube has blocked it from being seen in Australia although it worked when I first found it. I have linked another video clip, this time from Discovery TV, showing how the Earth might end in the very distant future.